Smartwatches have rapidly developed into a hub for a range of functions. Want to keep tabs on notifications? Easy. Need to track your heart rate and location when out running? Simples. But while the bigger players in the market are embroiled in an ongoing arms race to cram in as many features as possible into a svelte package, one startup aiming to scale the process back is Haikara. The Finnish company has just successfully completed a round of funding on Indiegogo, ahead of its $199 (eventual retail price of $329) smartwatch shipping to backers this December. But what's the reason behind this shift to simplicity? We spoke to the Haikara's David Blinov to find out. "If you go ahead and buy yourself a Samsung Gear smartwatch or an Apple Watch, you're getting another device that has exactly the same capabilities as a smartphone and it's also another device you have to charge at the end of the day," he said. "So for people who are used to minimalistic, mechanical watches, that you sort of set and forget, traditional smartwatches aren't really an option. If you want to monitor your heart rate and want a bunch of different sensors, Haikara isn't for you. We're not trying to compete with Apple and Samsung. This is the watch for people who would otherwise wear a mechanical watch and want a first step into the smartwatch arena." The Haikara watch has a 400 x 400 AMOLED display which you can use to switch watch faces and the features boil down to filtered alerts and the ability find or silence your phone. Designed by Finnish designer Harri Koskinen (Issey Miyake, Swarovski), it's made from stainless steel with four finishes: matte black, polished steel, gold and rose gold. Plus there's a blingy special edition with zirconia crystals around the bezel. On the straps side, there's 22mm, plain, embossed and perforated leather options (in 3 - 4 hues each) to pair with the model you choose. 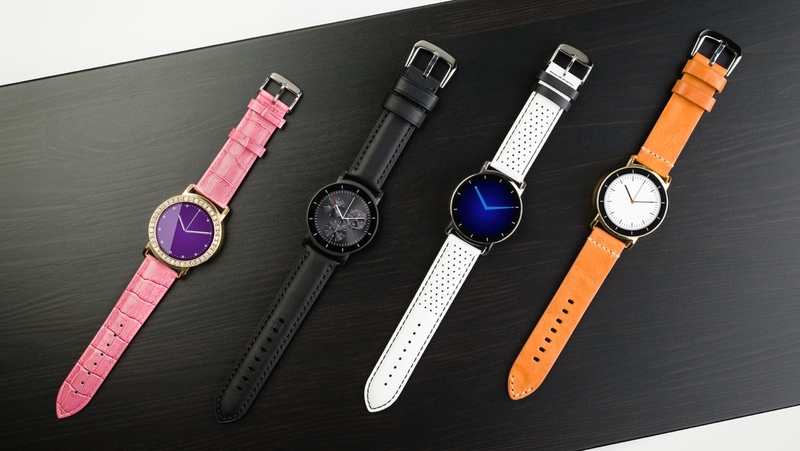 Although Haikara isn't aiming to replace those who like strapping on a do-it-all smartwatch, that doesn't mean it's out in the wild on its own; plenty of hybrids are out there looking to take over the wrists of those who want some, but not all, of the smartwatch experience. That's not to mention the Pebble-shaped whole in the smartwatch landscape since it was acquired by Fitbit. Blinov is optimistic his brand can make noise in the space in 2017. "We absolutely believe Haikara can compete with hybrid smartwatches, but obviously we're a much smaller company. Our focus is heavy on design. When we were planning this product and brainstorming what it should be and who it should appeal to, we focused 80% on design and 20% on technology. That's something that we feel sets us up apart from many brands," he told Wareable. As with most devices pushing tech to the back seat, the look of the watch is usually still the most important factor in its adoption. But while Haikara will neglect the usual sensors, it's still able to provide minimal, customised notifications — as opposed to the steady stream you would normally receive throughout the day — and also a seven day battery life when not in always-on mode. When always-on, it's more like eight to ten hours i.e what we're used to from AMOLED screened smartwatches. And, as a nice breath of fresh air, it will provide all this from its own operating system, something that Blinov said was to aid the design into sub-10mm thickness. He isn't stating the exact dimensions yet but the team is aiming to build one of the thinnest smartwatches around. "We wanted to go with something very lightweight, because something like Android Wear needs at least 512MB of RAM, and we wanted to go with something that we could build ourselves for our own needs. "The company who built it is called Korulabs, and their framework needs 1/1000th of the amount of RAM as Android Wear — so 512kb instead of 512MB. That allows us to limit the amount of memory and minimises the size and battery drain." Despite the device remaining relatively thin on the wrist, though, it's still only available in one 44mm model. And while this is billed as a unisex device, Blinov also admitted that feedback from women could lead to a new iteration further down the line. "We've heard feedback that women would prefer a slightly smaller size and that's something we'll be looking into early next year. Of course, it's also a big financial strain because you have to do the hardware design all over again, so because of that it's not something we'll be releasing in the beginning." For now, the company will be focusing on fulfilling the orders of 600+ backers with the campaign still live on Indiegogo. And after smashing through its target of $75,000, it's now also preparing more watch faces for users - something that is left to the in-house designers in order to maintain quality. And while we're yet to see or try the Haikara watch out for ourselves, it would appear to be another stylish design for those looking to find a balance between traditional watch and smart features.